The Church of the Nazarene invited the community to a meeting to hear a speaker from Monroe, South Carolina. From the moment she started speaking, she drew you into her story. She made you know that the world really was a place filled with loving and caring people. As I heard her talk, I knew that we were being called to be more active in our towns, to show the love we’re supposed to show to others, and to help someone in some way. The conviction came that it is time for me to stop talking about it, stop thinking about it, and start doing it. Maybe there were others in the room that felt the same conviction. I know there are a few who have the energy and passion to keep this going and it isn’t to get more people in their pews, it isn’t get more money in their coffers, it is because they know it’s time and it’s the right thing to do. And they would love for you to join them. You don’t have to be of the same denomination. You don’t have to be of the same generation. You don’t have to have the same accent. You don’t have to be the same color. 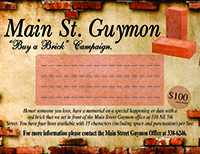 You just have to be willing to give some time to sharing your love of Guymon. The speaker spoke about a mentoring program where the mentors were asked to give 30 minutes a week, four times a month, about 38 months a year. That’s about 19 hours a year. Think you might want to do something like that? Contact Monty Sanders at 580-461-4459 if you would like to hear more about it. Or call me, Melyn Johnson, at 580-338-6246 if you want. Remember the words Winston Churchill said, “We make a living by what we get, but we make a life by what we give.” Let’s go make a life. And Mahatma Gandhi said, “The best way to find yourself is to lose yourself in the service of others.” Let’s go find ourselves. “As you grow older,” said actress Audrey Hepburn (I loved My Fair Lady), “you will discover that you have two hands – one for helping yourself, the other for helping others.” Let’s go get both hands busy. “The unselfish effort to bring cheer to others will be the beginning of a happier life for ourselves,” said Helen Keller. Let’s go get happier. These quotes are from some pretty exceptional folks that probably knew what they were talking about. And if you’re not from Guymon and you’re reading this, just substitute the name of where you’re from in for Guymon. It doesn’t matter where you’re at, it’s always true.